On March 8th, iLearn Schools Security Director, Sheriff (retired) Leo McGuire finished a tribute to all three Sept. 11th attack sites. Some months ago, Sheriff and Lt. William Zika, Port Authority Police (retired) began their trlogy of remembrance and respect with flags flown over the Pentagon. 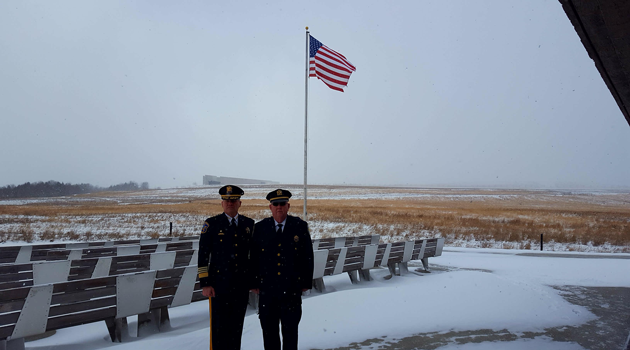 In a snowstorm in February, they raised the flags at the Flight 93 National Memorial in Pennsylvania. Zika arranged access to the National September 11th Memorial & Museum recently. In contrast to the snowstorm in PA, the day was picture perfect, with a similar gorgeous blue sky as that of the morning of 9/11. “While Bill and I didn’t mention it specifically, the beauty of the day was unmistakably similar to that fateful day in 2001 where 2917 innocent lives were lost.”, McGuire said.